On Memorial Day, 1921, four unknown servicemen were exhumed from four World War I American cemeteries in France. U.S. Army Sgt. Edward F. Younger, who was wounded in combat, highly decorated for valor and received the Distinguished Service Cross in “The Great War” selected the Unknown of World War I from four identical caskets at the city hall in Châlons-en-Champagne, France, on October 24, 1921. Younger selected the World War I Unknown by placing a spray of white roses on one of the caskets. He chose the third casket from the left. The chosen Unknown was transported to the United States aboard the USS Olympia. Those remaining were interred in the Meuse Argonne Cemetery, France. The World War I Unknown lay in state in the Capitol Rotunda from his arrival in the United States until Armistice Day, 1921. 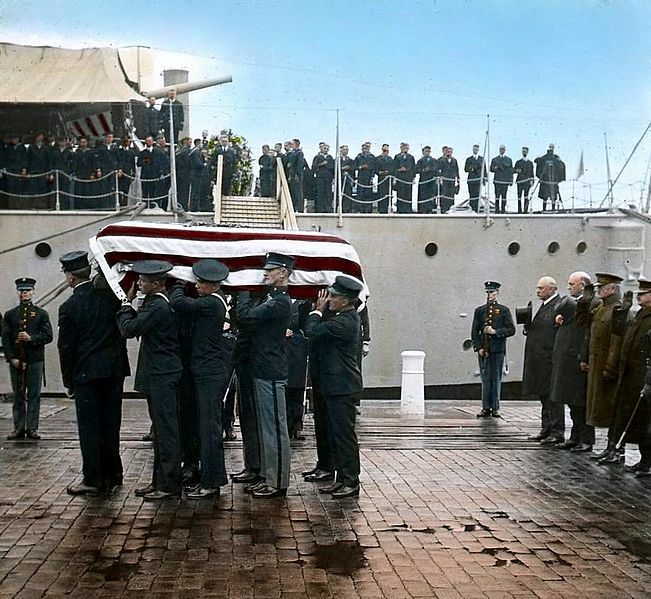 On November 11, 1921, President Warren G. Harding officiated at the interment ceremonies at the Memorial Amphitheater at Arlington National Cemetery. During the ceremony, the World War I Unknown was awarded the Victoria Cross by Admiral of the Fleet Lord Beatty, on behalf of King George V of the United Kingdom. (The United Kingdom Victoria Cross was placed with the soldier. Earlier, on March 4, 1921, the British Unknown Warrior was conferred the U.S. Medal of Honor by General of the Armies John Pershing.) In 1928, the Unknown Soldier was presented the Silver Buffalo Award for distinguished service to America’s youth by the Boy Scouts of America. On August 3, 1956, President Dwight D. Eisenhower signed a bill to select and pay tribute to the Unknowns of World War II and the Korean War. The selection ceremonies and the interment of these Unknowns took place in 1958. The World War II Unknown was selected from remains exhumed from cemeteries in Europe, Africa, Hawaii, and the Philippines. 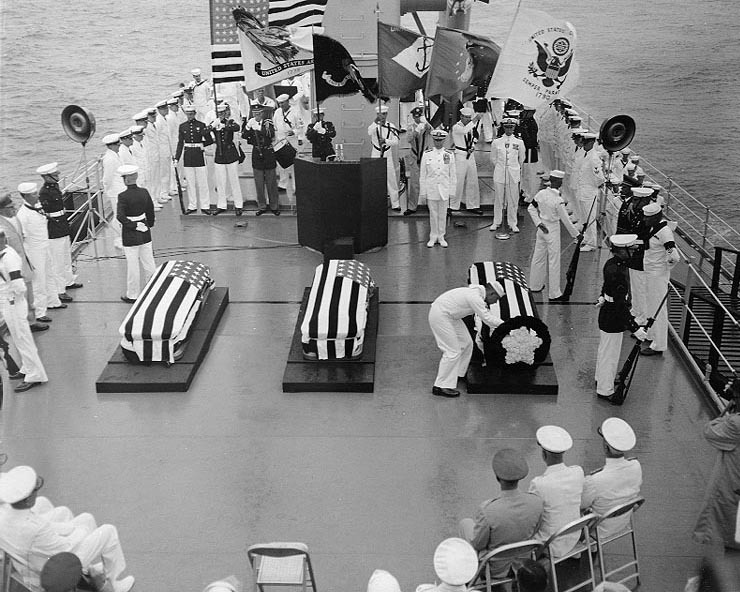 Two Unknowns from World War II, one from the European Theater and one from the Pacific Theater, were placed in identical caskets and taken aboard the USS Canberra, a guided-missile cruiser resting off the Virginia Capes. Navy Hospital Corpsman 1st Class William R. Charette, then the U.S. Navy’s only active-duty Medal of Honor recipient, selected the World War II Unknown. The remaining casket received a solemn burial at sea. Four unknown Americans who died in the Korean War were disinterred from the National Cemetery of the Pacific in Hawaii. Army Master Sergeant Ned Lyle made the final selection. Both caskets arrived in Washington on May 28, 1958, where they lay in the Capitol Rotunda until the morning of May 30, when they were carried on caissons to Arlington National Cemetery. President Eisenhower awarded each the Medal of Honor, and the Unknowns of World War II and the Korean War were interred in the plaza beside their World War I comrade. The designation of the Vietnam Unknown has proven to be difficult. With improvements in DNA testing it is possible, though unlikely, that the recovered remains for every unknown soldier killed in the Vietnam War will be identified. The Vietnam Unknown service member was designated by Medal of Honor recipient U.S. Marine Corps Sgt. Maj. Allan Jay Kellogg, Jr., during a ceremony at Pearl Harbor, Hawaii, May 17, 1984. The Vietnam Unknown was transported aboard the guided missile frigate USS Brewton (FF-1086) to Naval Air Station Alameda, California. The remains were then sent to Travis Air Force Base, California, May 24. The Vietnam Unknown arrived at Andrews Air Force Base, Maryland, the next day. The Tomb guards stood at death watch for the entire day as thousands of people braved the dreary weather to pay their respects. The presidential wreath was brought forward toward President Reagan during the interment ceremony for the Unknown Serviceman of the Vietnam Era at the Tomb of the Unknowns on May 28, 1984. Many Vietnam veterans and President Ronald Reagan and Nancy Reagan visited the Vietnam Unknown in the U.S. Capitol. An Army caisson carried the Vietnam Unknown from the Capitol to the Memorial Amphitheater at Arlington National Cemetery on Memorial Day, May 28, 1984. President Reagan presided over the funeral, and presented the Medal of Honor to the Vietnam Unknown, and also acted as next of kin by accepting the interment flag at the end of the ceremony. The interment flags of all Unknowns at the Tomb of the Unknowns are on view in the Memorial Display Room. In 1994, Ted Sampley, a POW/MIA activist, determined that the remains of the Vietnam Unknown were likely those of Air Force 1st Lt. Michael Joseph Blassie, who was shot down near An Loc, Vietnam, in 1972. Sampley published an article in his newsletter and contacted Blassie’s family, who attempted to pursue the case with the Air Force’s casualty office without result. In January 1998 CBS News broadcast a report based on Sampley’s investigation which brought political pressure to support the identification of the remains. The body was exhumed on May 14, 1998. Based on mitochondrial DNA testing, Department of Defense scientists confirmed the remains were those of Blassie. The identification was announced on June 30, 1998, and on July 10, Blassie’s remains arrived home to his family in St. Louis, Missouri; he was reinterred at Jefferson Barracks National Cemetery on July 11. The crypt that once held the remains of the Vietnam Unknown has been replaced. The original inscription of “Vietnam” and the dates of the conflict has been changed to “Honoring and Keeping Faith with America’s Missing Servicemen.” as a reminder of the commitment of the Armed Forces to fullest possible accounting of missing service members.